In December, as toroidal field conductor unit length #133 came off the production line, the ITER community celebrated a major milestone—the end of a nine-year procurement campaign to procure 88 km of niobium-tin (Nb3Sn) superconductor for ITER's toroidal field coils. Six ITER Members have contributed to the production of 88 km of toroidal field conductors: China (7.5 percent), Europe (20.18 percent), Japan (25 percent), Korea (20.18 percent), Russia (19.3 percent) and the United States (8 percent). 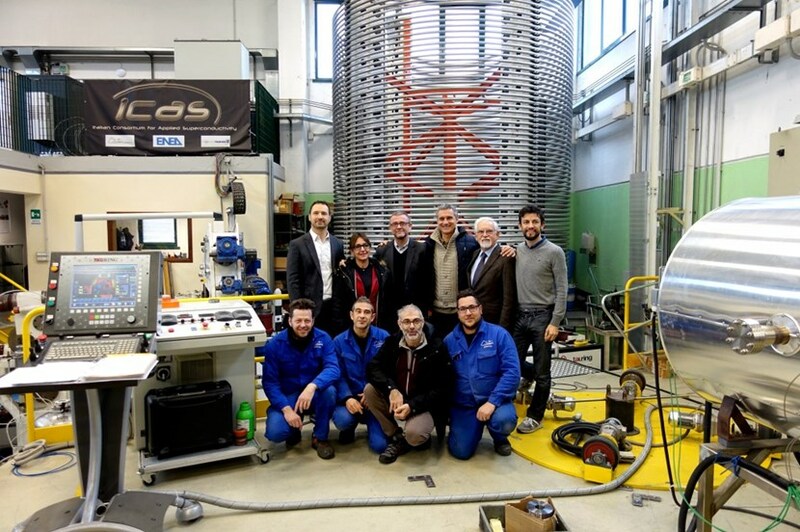 The last conductor unit length was produced by the ICAS consortium in Italy (pictured) in December 2016. Six ITER Members have participated in ITER's longest running procurement effort: China, Europe, Japan, Korea, Russia and the United States. Considered a difficult material to work with due to the sensitivity of the Nb3Sn superconducting strands to strain, the world production capacity in 2007 at the start of the campaign did not exceed 15 tonnes per year. To meet ITER's needs, this had to be ramped up by one order of magnitude. In close association with the ITER Organization, the ITER Members developed winding and jacketing facilities, launched qualification programs for processes and tooling, and followed demanding process control and certification standards to ensure conformity with ITER's technical specifications. Some 500 tonnes of copper and niobium-tin (Nb3Sn) multifilament composite wires were produced for the toroidal field coils, then "bundled" to form cables and contained in a structural steel jacket. Eight strand suppliers and four jacketing facilities were qualified by the ITER Organization in the course of the global procurement effort. The last toroidal field conductor unit length was jacketed in December 2016 by the European ICAS consortium in Italy from superconducting cable manufactured in the US and steel tubes sourced in Japan by the US Domestic Agency. "This milestone represents the end of an amazing and challenging nine-year journey, which has been completed on time due to the good understanding and collaborative spirit between the partners," said an enthusiastic Arnaud Devred, head of the Superconductor Systems & Auxiliaries Section at ITER. "This procurement sums up much that is ITER—advanced technology, innovation, perseverance and strong international collaboration. For me, it's an excellent illustration of how ITER is bringing people together." The many technical issues encountered along the way were overcome by facing them head-on and working out pragmatic solutions together, added Arnaud. "This spirit is expected to continue in the next phases of the toroidal field magnet procurement, as our European and Japanese partners produce the final coils." Eighty-eight kilometres of cable-in-conduit conductors for the toroidal field coils represents approximately 825 tonnes of material and an estimated market value of EUR 350 million.